This recipe is so simple, I almost feel bad for sharing it, but it was so delicious and so ridiculously simple, I thought why not share it with everyone. Cobblers are made all over the south. They are a great way to use up ripe fruit from the trees in your yard, or fruit sold out of pickup trucks and car trunks on the side of the road all over the south come summer. 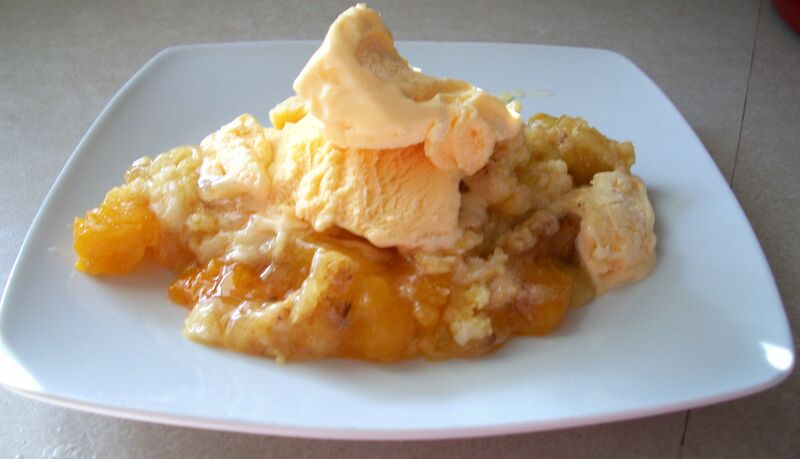 Everyone loves a cobbler and this is probably the easiest cobbler I’ve ever made that tasted like a homemade dessert. Sure, you can open a couple of cans of fruit pie filling and throw on a pre-made cobbler crust, but this recipe actually tastes homemade. Give it a shot and you’re sure to impress your family and friends! Preheat the oven to 350F. In a heavy bottom saucepan, cook the fruit and brown sugar until hot and bubbly. Pour fruit into a greased casserole dish (I use a deep dish Corningware French White lasagna casserole, about 3″-4″ deep so it won’t bubble out when baking). If you want to add nuts, sprinkle them liberally over the top of the fruit. Open the butter cake mix and pour over the top of the fruit. Don’t mix up the mix, use the mix in its dry form straight from the box. Melt the butter in a glass measuring cup and pour over the top of the cake mix, covering as much of the surface with the butter as possible. Bake for 30-40 minutes, until bubbly and golden brown. If you really want a rich version of this recipe, use 3 sticks of butter instead of 2. It’s delicious, but will surely clog your arteries. We’d call the 3 stick version the Paula Dean Redneck Cobbler! This entry was posted in Dessert and tagged almonds, butter, cake mix, cobbler, fruit, pecans by quarlj01. Bookmark the permalink.